According to Mike Chappell of CBS Indianapolis, Indianapolis Colts offensive coordinator Rod Chudzinski said RB Robert Turbin has “had a hell of a spring … much better this spring than he was this time of year a year ago.’’ While it’s clear that veteran Frank Gore will remain as the featured back, Chappell predicts that Turbin is in line for more opportunities in 2017. 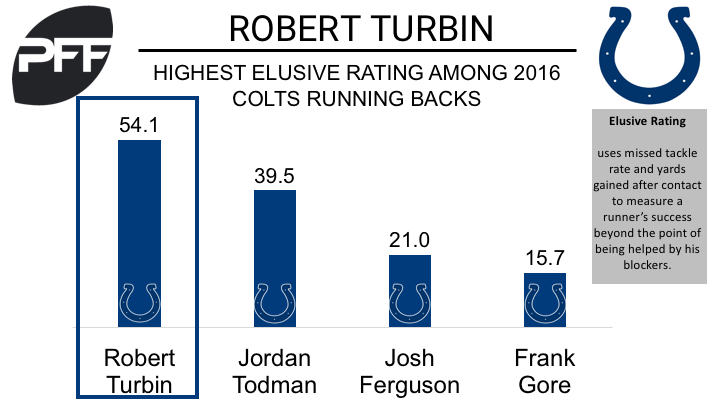 Last season, Turbin was one of the league’s premier short-yardage backs. He was given the ball on 3rd and 3 or less 11 times, and converted 10 of those attempts, for a conversion percentage of 90.9 percent, the highest mark among all backs with at least 10 attempts on 3rd and 3 or less. Turbin’s performance in 2016 merits an increase in carries for 2017. He proved to be good with the ball in his hands, and forced 10 missed tackles on his 47 rushing attempts. He earned a PFF elusive rating of 54.1, the highest of all Indianapolis Colts running backs in 2016.